Our vacation to Sardinia provided a lot of inspiration for dishes to cook. 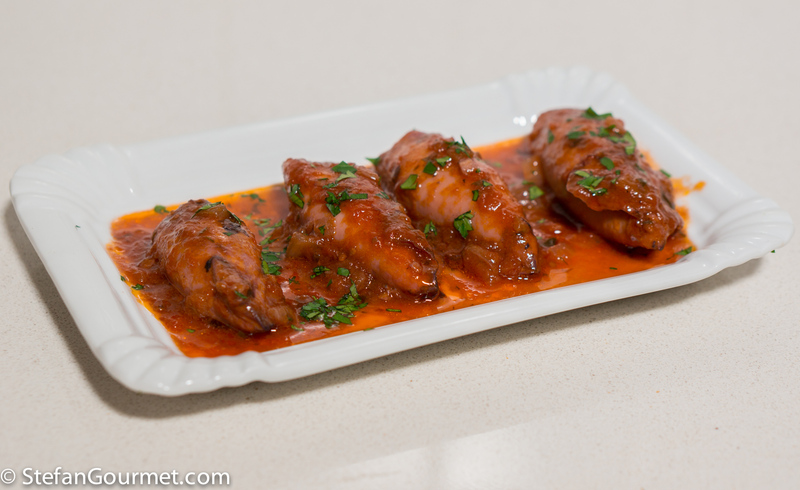 Yet another one from La Perla in Calasetta is stuffed calamari braised in tomato sauce. This reminded me of a recipe by Biba Caggiano that I still wanted to make, so today’s recipe is more Emilia-Romagna than it is Sardegna. The main difference is the use of parmigiano reggiano for the filling, which is a very Emilia-Romagna thing to do but not Sardinian. In Sardinia they would not use cheese at all (which is an exception in Italian seafood dishes anyway), and if they did it would be pecorino sardo (Sardinian sheep’s milk cheese). 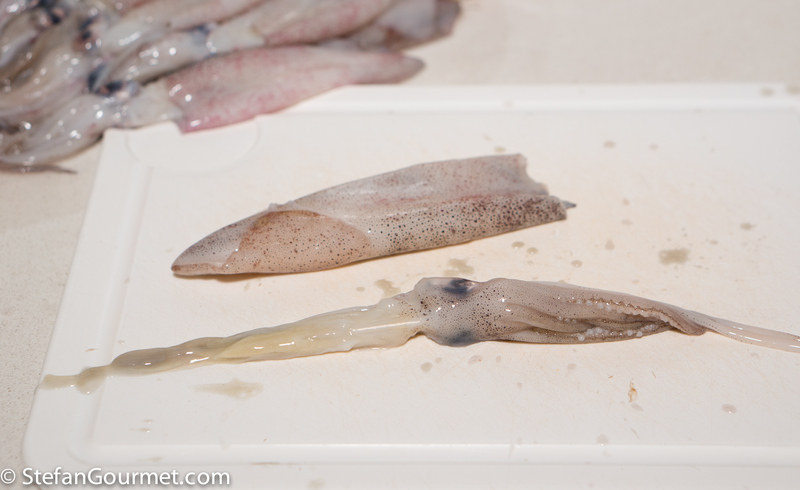 There is sometimes confusion about different types of squid and how they are called. 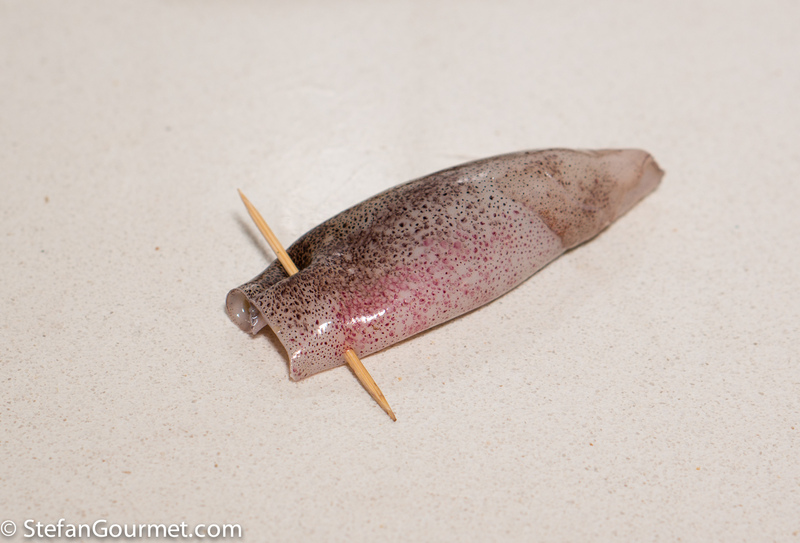 The squid I used for this is Loligo Opalescens and is called calamari in Italy, but you could also use what is called totani in Italy. They are quite small: there are about 20 in one kilo (9 per lb) and their bodies are about 10 cm (4 inches) long. I prepared this recipe for two Italian friends that live in Amsterdam and came over for dinner, and they both raved about how good it was. (They tend to give positive reviews on everything I cook for them, but this was exceptional with lots of “Che bontà!” and the like.) The calamari are filled with a mixture that contains their tentacles as well as the aforementioned parmigiano, capers, and anchovies, and they are braised slowly in tomato sauce. The calamari end up very tender and the tomato sauce is amazing, so make sure to have good Italian bread to mop up the sauce (fare la scarpetta, as they say in Italy). If you have any sauce leftover, it would be wonderful to dress spaghetti or linguine. 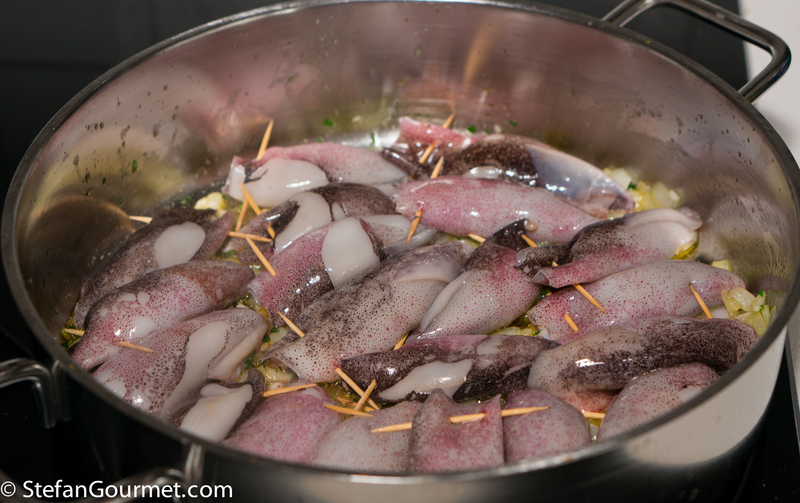 You can serve these calamari either as antipasti or as secondo. Start by cleaning the squid. First pull the head with the eyes and the tentacles out of the body. 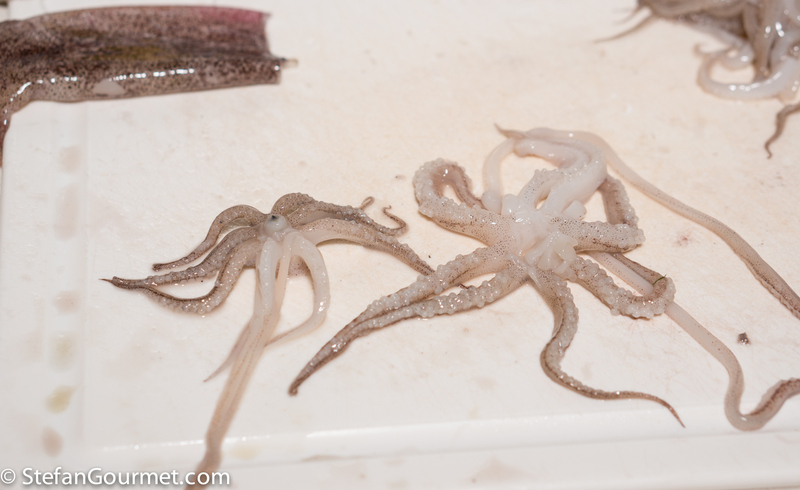 Then cut off the tentacles just below the eyes. Keep the tentacles and discard from the eyes upwards. With your fingers, remove anything you find inside the body, including the transparent bone. In the center of the tentacles is the beak, as shown on the left. You can easily pop it out. Keep going until you have done all of the squid. You should end up with bodies and tentacles. Reserve the bodies for now. Put the tentacles in the food processor together with 1/4 tsp chilli flakes (peperoncino), 1/4 tsp salt, 4 Tbsp (60 ml) extra virgin olive oil, 15 grams (1/3 cup) freshly grated parmigiano reggiano, 50 grams (1/3 cup) dried breadcrumbs, 1 Tbsp minced flat leaf parsley, 1 garlic clove (chopped), 3 anchovy fillets (chopped), and 1 Tbsp capers (rinsed and dried). Process until smooth. 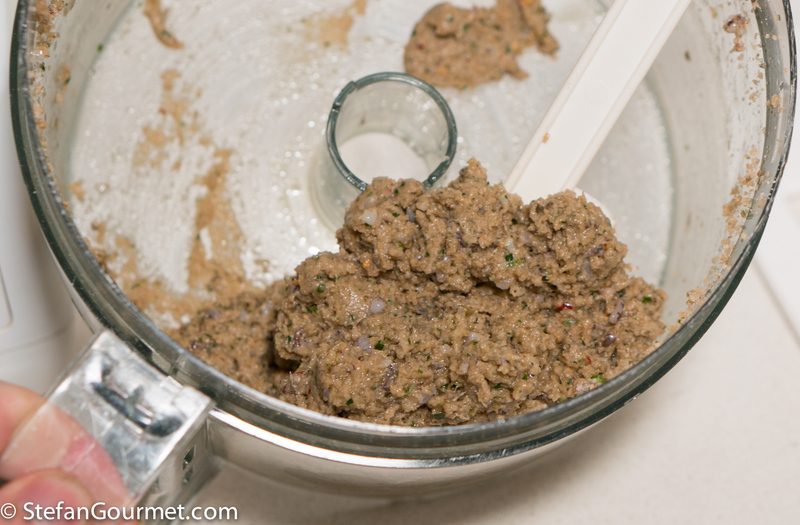 The mixture shouldhave a nice creamy consistency. Add some more olive oil if needed. 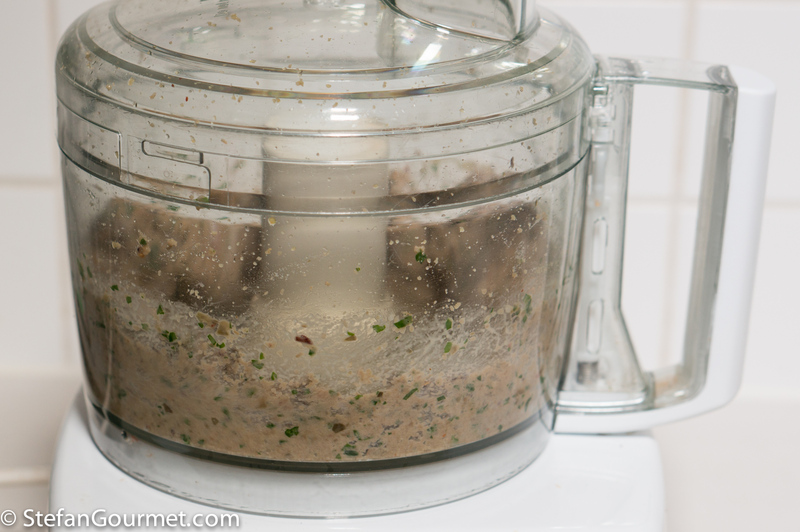 Fill the bodies about halfway with the mixture. 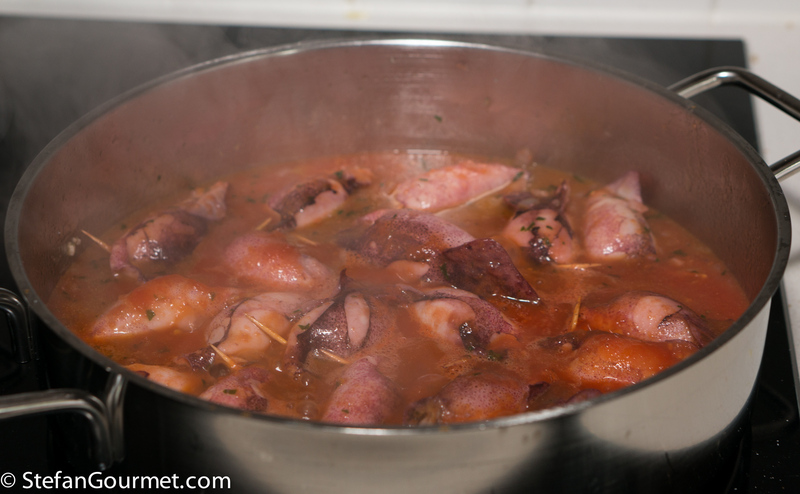 The filling will expand during the cooking, and besides there is not enough filling to stuff all of them completely. A piping bag is helpful for this chore. Insert the tip of the piping bag into the body, then hold the body firmly around the top with one hand while you squeeze with your other hand. Secure each one with a toothpick. Keep going until you have stuffed all of them. 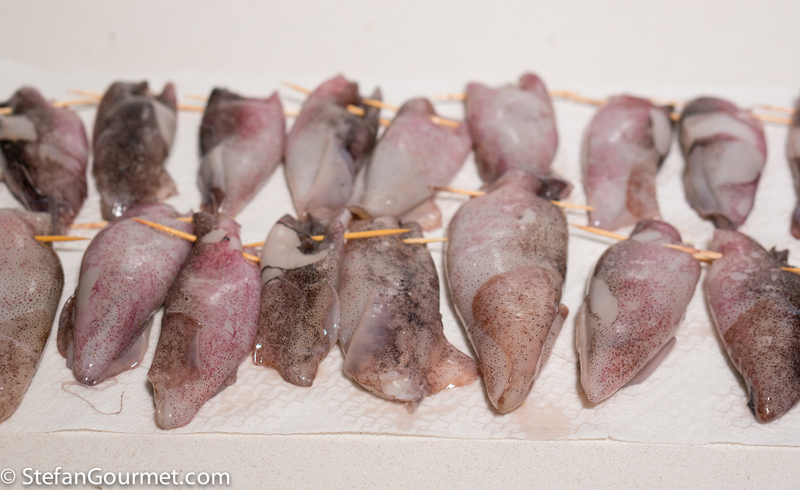 You can prepare everything up to this point in advance and refrigerate the stuffed squid. 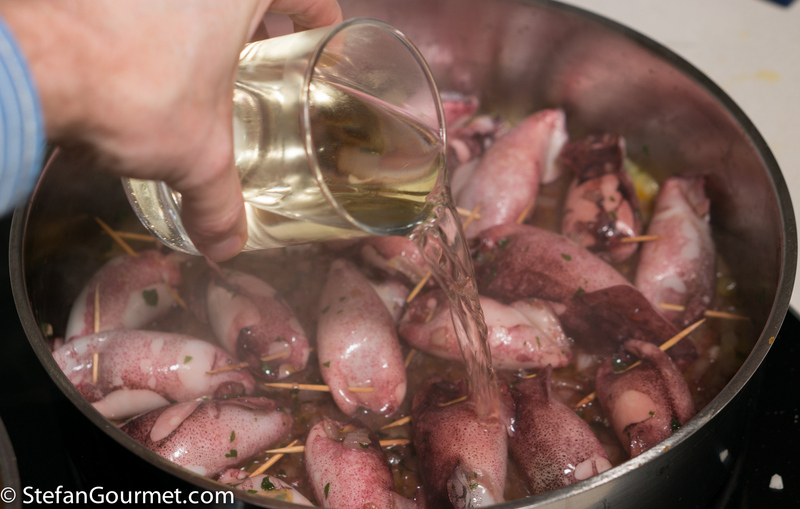 For the best results, serve the squid at once after cooking rather than cooking, chilling, and reheating. This will make the squid less tender. Heat 2 tablespoons olive oil in a frying pan that is large enough to just hold the squid in a single layer (that means a frying pan with a bottom of 28 cm/11 inch). 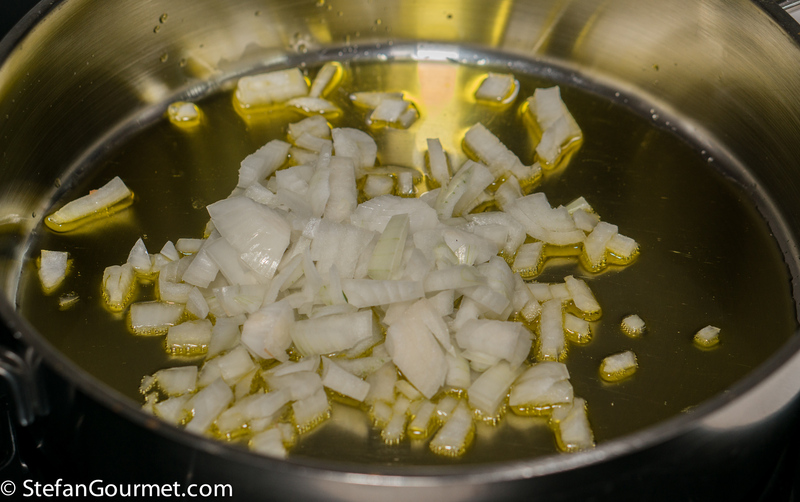 Add a chopped onion and season with salt. 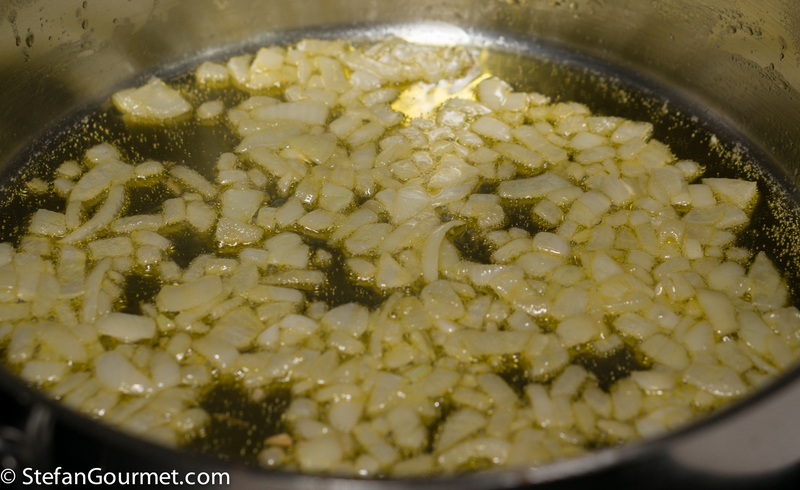 Stir over medium heat until the onion is soft and slightly golden, about 10 minutes. In the meantime, pat the squid dry with paper towels. 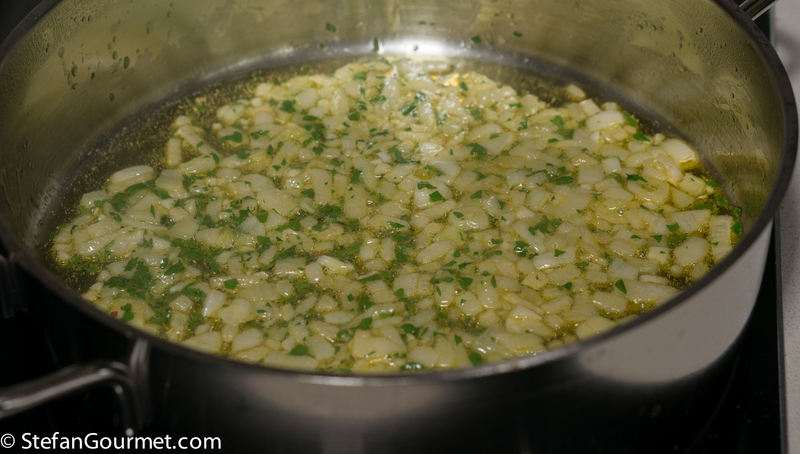 When the onions are soft and golden, add a tablespoon of minced parsley and a minced clove of garlic, and stir briefly. Arrange the squid on top of the onions in a single layer. Cook, still over medium heat, for 2 minutes. 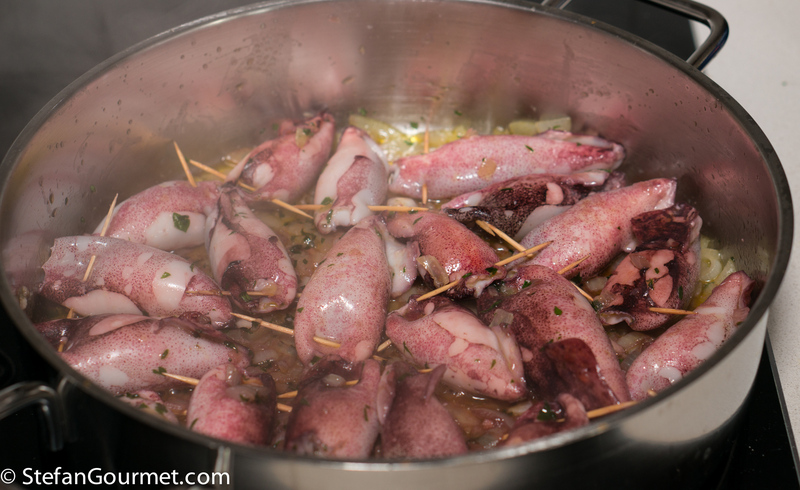 Carefully turn the squid and cook for another 2 minutes on the other side. Add 120 ml of dry white wine. Bring to a boil and allow the alcohol to evaporate for a minute. Add a pureed can of tomatoes. Season with salt, stir gently, and bring to a boil. 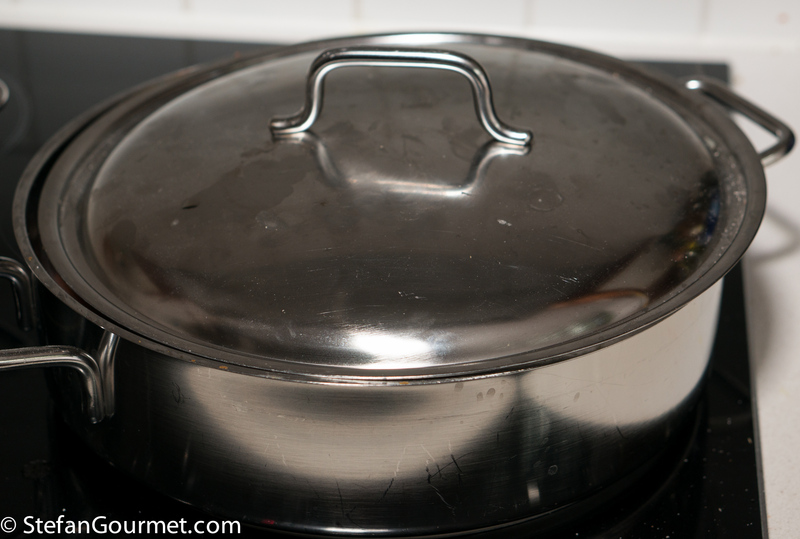 Partially cover the pan. 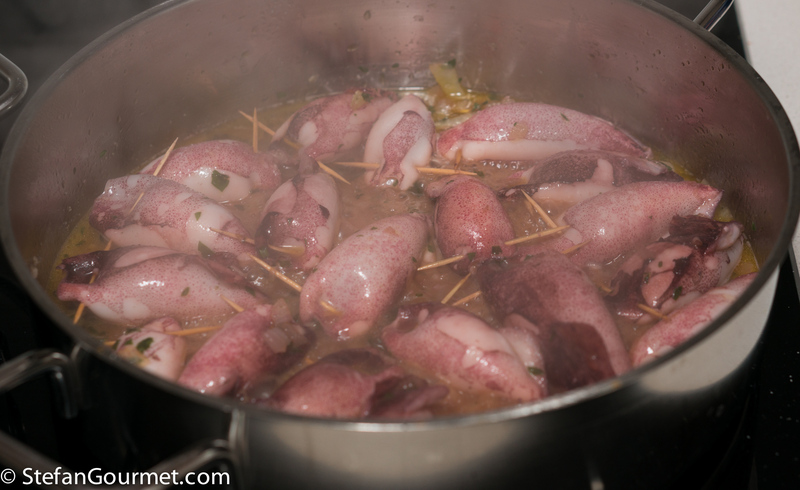 Reduce the heat to a simmer and cook until the squid is tender, about 45 minutes. Turn the squid gently every 10 minutes or so. Turn off the heat. The sauce should have thickened. Taste and adjust the seasoning of the sauce if needed. 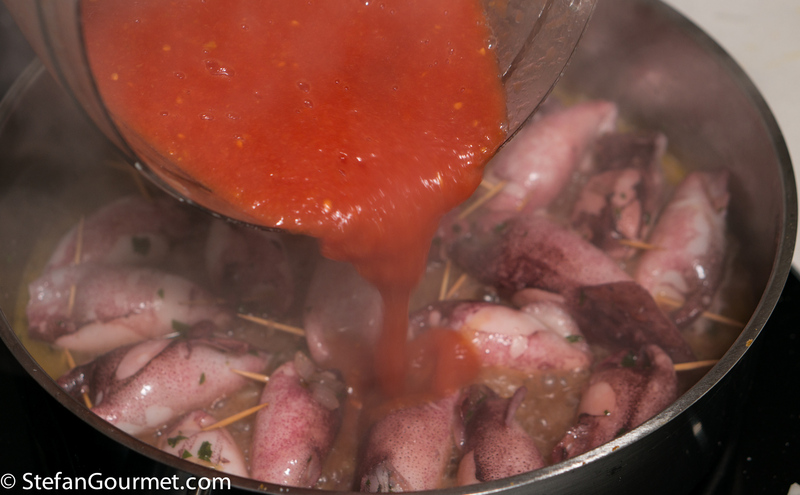 Serve the squid at once, and spoon some sauce over them. 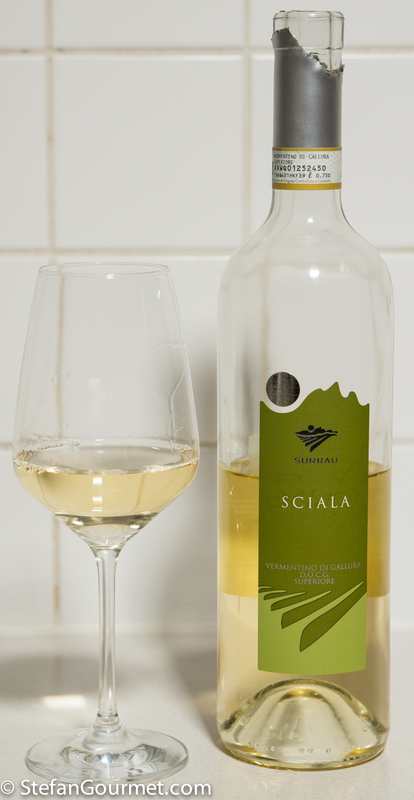 Since the dish was inspired by our trip to Sardinia, it was appropriate to pair this with a Vermentino from that island. 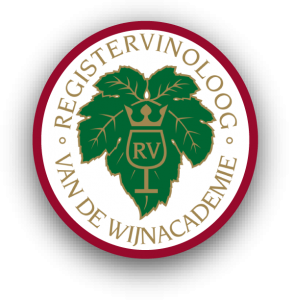 Many other medium to full bodied dry whites from the Italian coast will also work splendidly, like a Verdicchio, Fiano, or Greco. 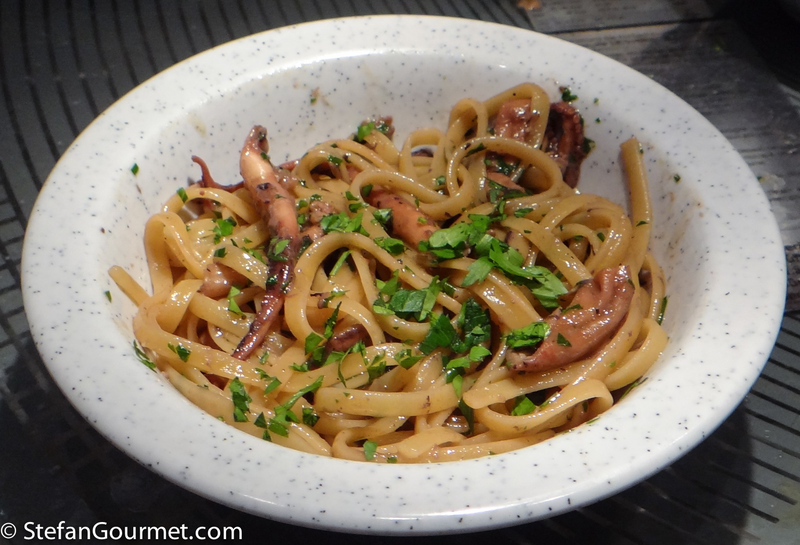 Moscardini, baby octopus, cooked sous-vide is great over pasta. 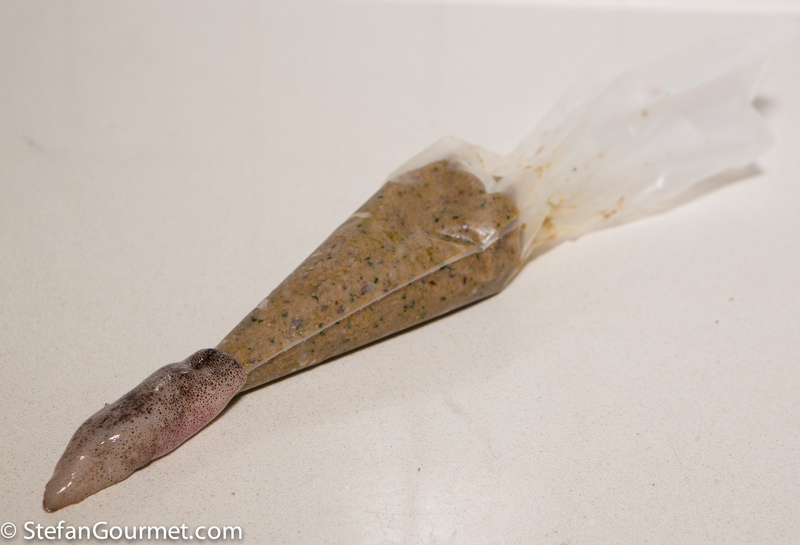 Just like regular octopus, the moscardini release a flavorful liquid that I used to make a simple pasta sauce. The result was very tasty indeed, with great depth of flavor. Excellent Dish. I have always stripped the outer speckled membrane of as a matter of course (because that what I was taught to do). I am going to try a dish like this without that step… it sounds like it is not essential. I only do that with much bigger calamari, as then the skin is a lot thicker. Mi hai convinta, li farò, anche se non è più tanto stagione. Sono contenta che tu abbia imparato “fare la scarpetta”. 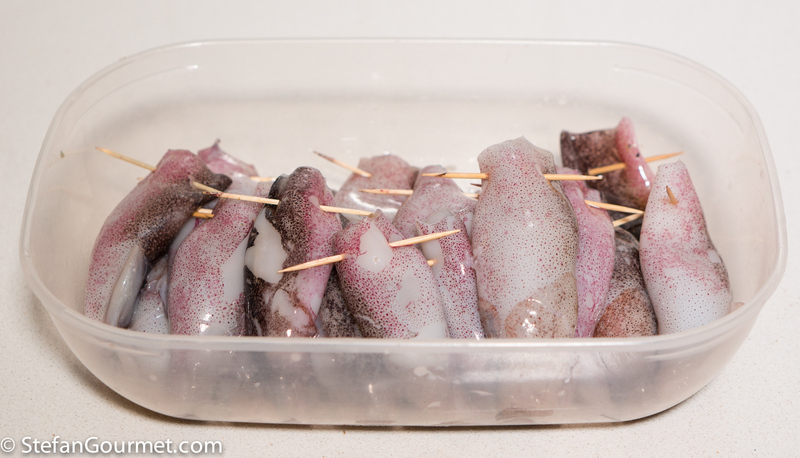 Da noi non ci sono mai calamari cosi’ piccoli freschi, solo quelli da 700 grammi l’uno. Beautiful, my Mother made this every Christmas Eve. Reminds me of home!! Thank you for the Italian food naming lesson as well as recipe . . . . methinks I can and do buy ‘totami’ most often. And again ‘secondo’ on my table. Do not ‘do’ much ‘long cook’ with these babies but shall try soonest . . . .
Het lijkt me heerlijk. Ik ga het beslist een keer maken. very good. 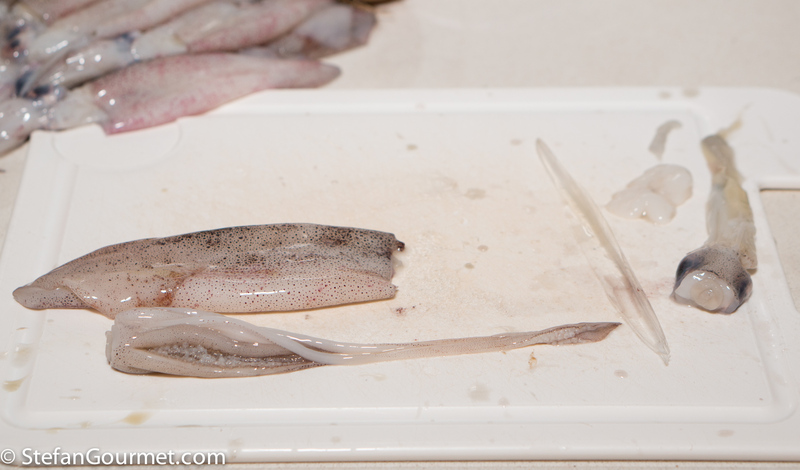 here in the uk it is not easy to find small frozen squid with their tentacles . I agree with one of the above comments: this recipes is very christmassy…in the south of Italy, the 24th supper (called vigilia in italian) is generally a fish only feast. Well it certainly is boring in that once you’ve figured out the correct time and temperature the result will always be the same. I think that is a big example. You should really try branzino fillets cooked sous-vide for 10 minutes at 48C and then seared very briefly over high heat. Definitely not boring! The time relates to the thickness. For a branzino of about 500 grams the thickness is so little that 10 minutes is enough. For 2.5 centimeters it is 30 minutes, but I doubt you could find a branzino that big. 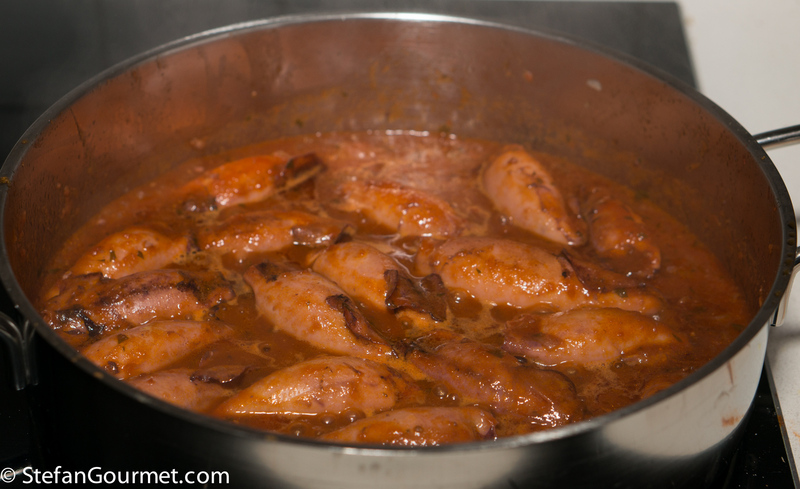 I never prepare stuffed calamari covered in tomato sauce since my family doesn’t like it, but every now and then I order it when eating out, like it very much – your recipe sounds as delicious as always! You could always make this with a white wine sauce. That sounds amazing, and delicious too! 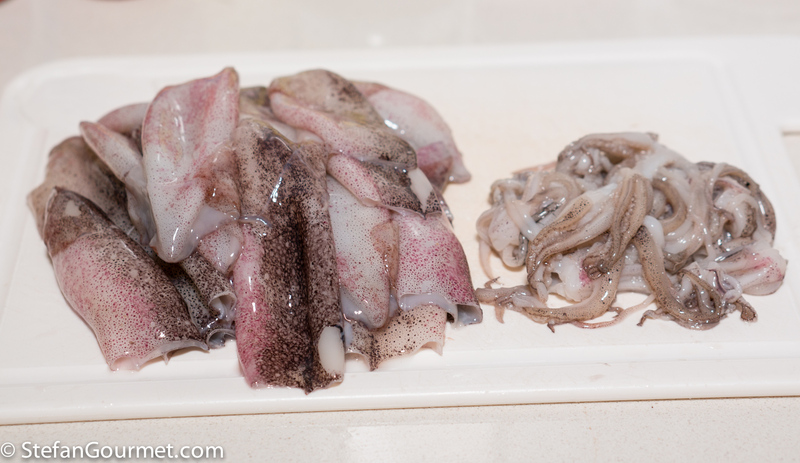 I love these dishes but man do i hate to clean squid. I try to buy it cleaned whenever possible. Hi Stefan, I’m going to give this dish a try tomorrow. Just bought a small place in Sardinia, so can’t wait to discover more of the Sardo kitchen.. Very happy with your tips for restaurants in Palau as well. Thanks! Hi Marjolein, that place in Sardinia sounds great! We are going back there in September. 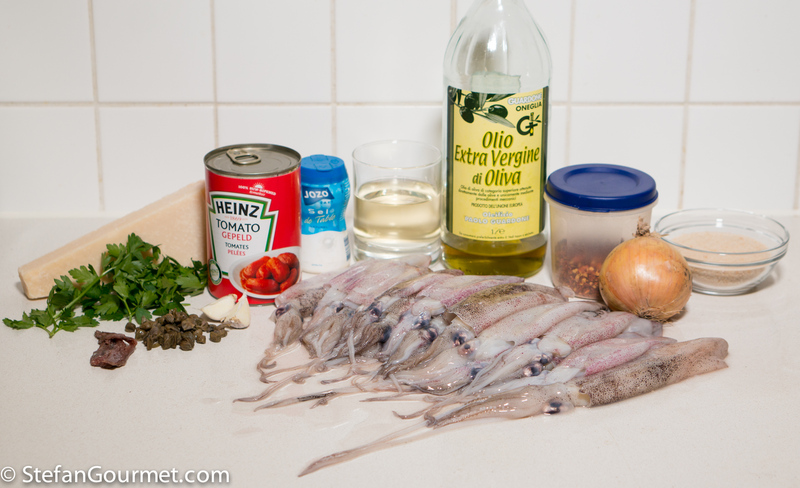 Let me know how the calamari ripieni turn out!